I recently read a very interesting article from author Dave Van Knapp, related to the four percent rule. Dave analyzed research from Morningstar, which claimed that the four percent rule is no longer relevant, and should be replaced with a three percent rule. In this argument, I am going to discuss the root causes behind this issue, as well as the surprising reasons behind the real factors behind the four percent rule that made it truly successful. The following chart below shows the dividend yield in the S&P 500 (SPY) between 1926 and 2011. All data used was obtained from Prof. Schiller’s website. 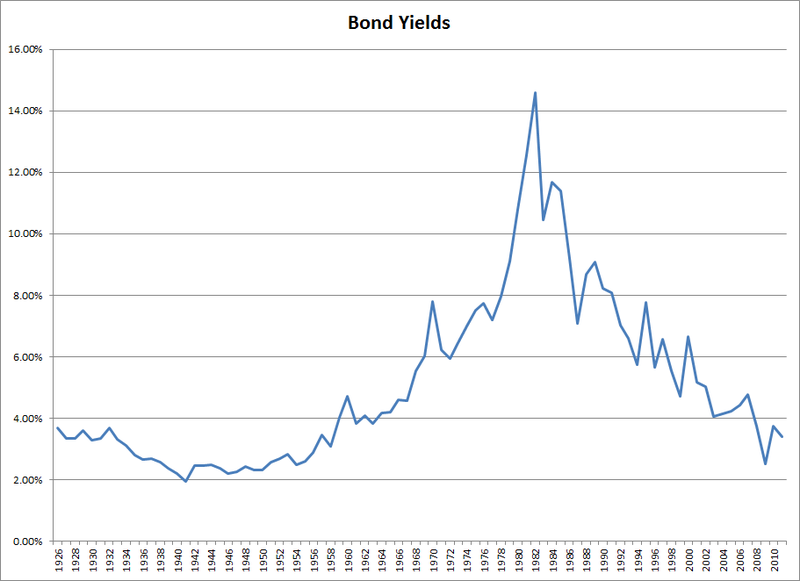 This chart, shows the average annual yield of a portfolio where 50% invested in S&P 500 and the remainder is put in a US Ten-Year bond. The next chart shows the growth in dividend payments of the S&P 500. I used the S&P 500 as a proxy for dividend stocks, given the fact that data was widely available for the index, and it is an adequate proxy for dividend stocks. Annual dividend returns are less volatile than annual price returns. It is extremely difficult to forecast if a stock is going to return a positive price gain in a given year or a negative one. However, it is much easier to forecast whether a company will be able to deliver a dividend return to its shareholders over the course of a year. For example, I am 99% certain that Wal-Mart Stores (WMT), McDonald's (MCD) and Coca-Cola (KO) would still be paying a dividend over the next 12 months. Chances are also that these companies would raise dividends through April 1, 2014 at least once. I believe that the reason why the four percent rule was successful was not because stocks tended to increase in value over time, but because the income generated from an equally weighted stock and bond portfolio is a reliable source of spending money for retirees. It is easier to begin retirement if you invested at times when stocks were attractively valued. When stocks are cheap, they have low P/E ratios and relatively high dividend yields. A sustainable dividend payment, which more than covers investors expenses, provides for an adequate margin of safety to cover these expenses. Based on the data, it could be argued that the four percent rule has traditionally been based on the stability of stock and bond yields and the positive dividend growth that investing in a basket of blue chip common stocks can deliver over time. Back in the early 1990’s, when William Bengen conducted his research, dividend yields were close to 4%, while yields on 30 year US Treasuries were anywhere between 7 – 8%. 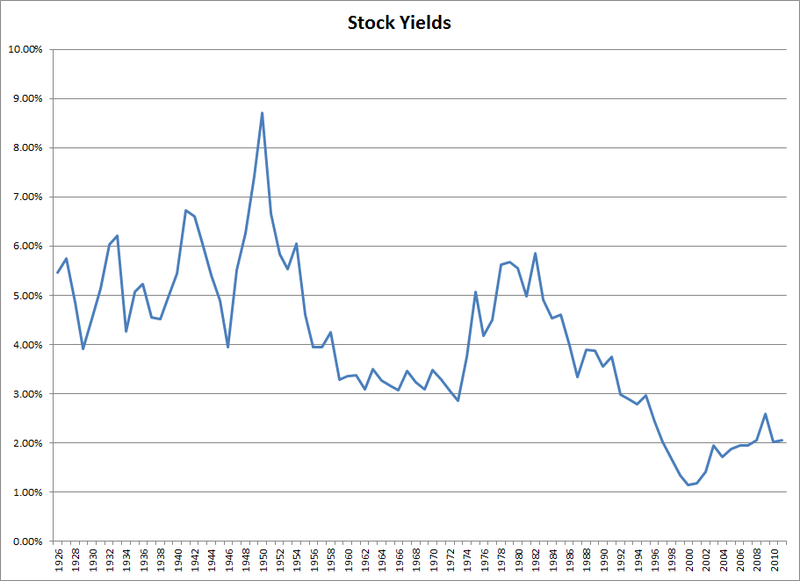 For the large part of the 1926 - 1994 study period, the average yield of a portfolio that consisted of 50% equity and 50% fixed income exposure was 4.87%. 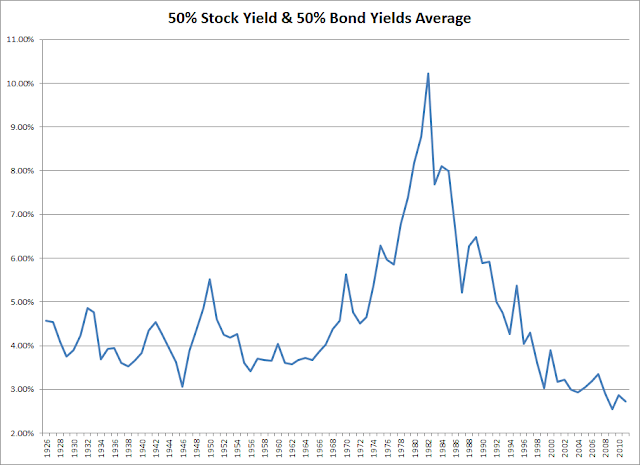 The average yield was less than 4% in only 24 out 69 years observed. 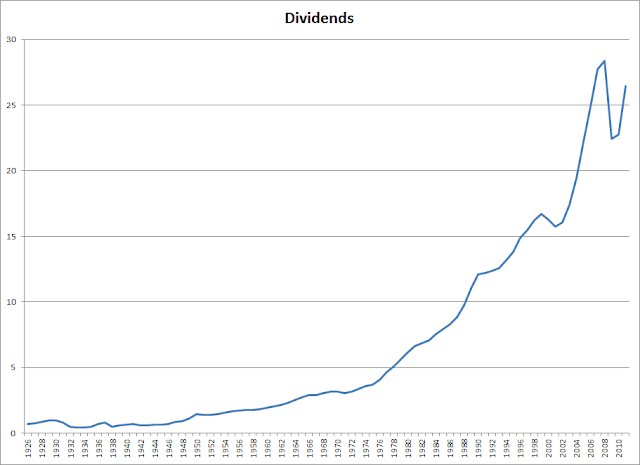 It is particularly interesting that in a traditional dividend portfolio, the goal is to generate a growing stream of distributions. A portfolio could yield 4% today, but over time and given a 6% dividend growth rate, it could double the yield on cost to 8% in 12 years and to 16% in 24 years. In the traditional portfolio described in Bengen’s research, an investor starts out by withdrawing an amount equivalent to 4% of the initial portfolio value every year, and then adjusts it every year with inflation. I see some similarities between the two approaches, and find that Bengen incidentally might have been following portfolio yield on cost, that many dividend growth investors tend to closely monitor. Given the steep declines in bond and dividend yields over the past 20 years, the new research now claims that the four percent rule should be a three percent rule. Not surprisingly, an allocation to stocks and bonds could easily yield 3% in today’s environment. This further strengthens the argument that that the original four percent rule was based on relying on the stable dividend and bond interest factor that investors would have received.